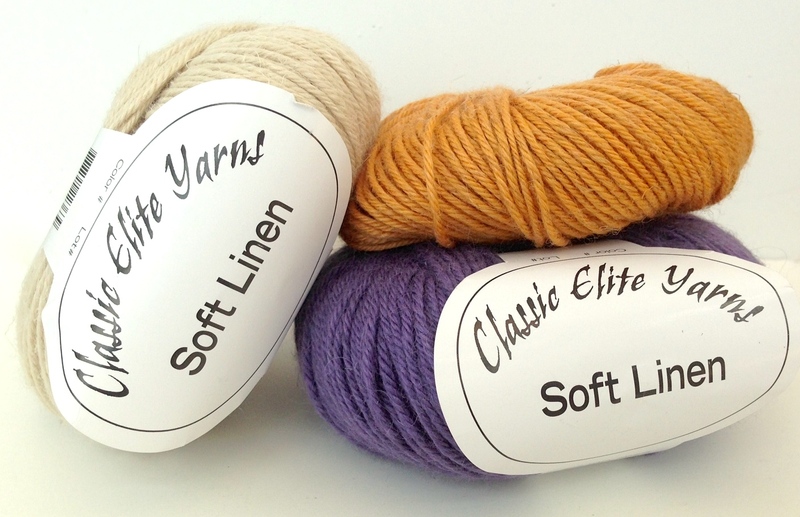 Here’s a nice summer and fall yarn for you to try – Classic Elite Yarns Soft Linen. I admit, I’m just not a big fan of linen. It’s too harsh on my hands, so I don’t enjoy the knitting process even though I know the results will wash out to a nice soft fabric. I’ve tried more than once – can’t do it. There is no harshness problem with this Soft Linen that’s 30% baby alpaca, 35% wool and 35% linen. It’s an interesting blend I haven’t seen elsewhere. The linen makes a difference; it’s nice to knit with even in warm weather. 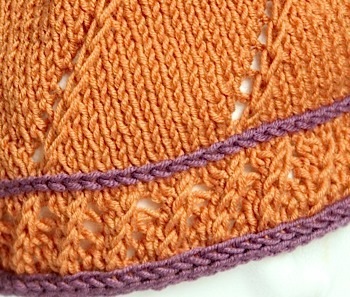 Here’s a peek at the blocked sleeve of a fall cardigan I have on needles now. The drape when wet blocked is delightful; soft and flat with good stitch definition. I’m pleased with the result and glad that I learned my lesson about blocking new yarns. You may notice a few familiar Nuances. 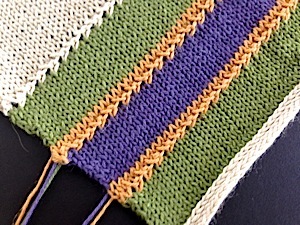 The Duality Cast On (in white) with adjacent i-cord bind off and the non-garter raised ridges. I’ll be introducing a new sleeve idea with this pattern so I had best get knitting. The Duality Cast On is a twist on the standard provisional crochet cast on with an eye towards adding a design feature. This orange Vortex Hat with purple accents shows how you can add contrast in both color and direction. 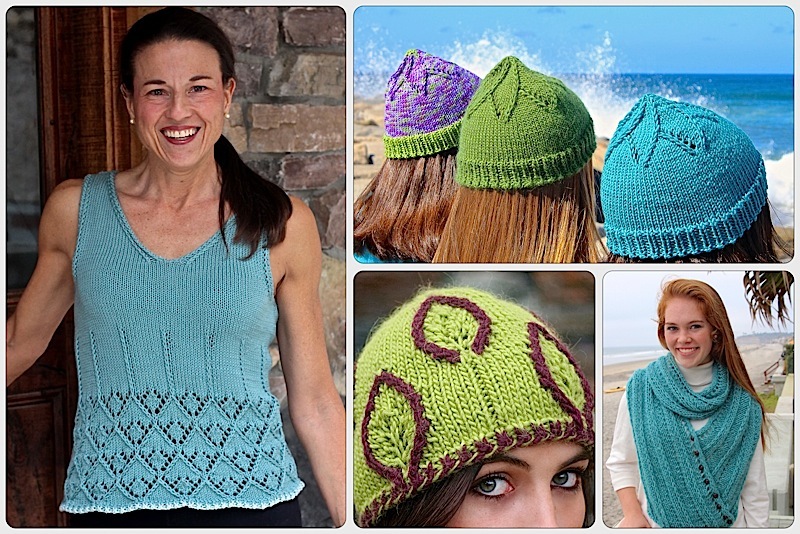 It’s a fun hat with so many design options it could easily become your ‘go to’ hat pattern. Sign up for our Quarterly Newsletter to make sure you don’t miss the sweater announcement. The new sleeve technique that will be featured, is so much easier you may never have a UFO sweater again. This time if year I usually put down the knitting because I get so hot. I’m excited to try the linen yarn . It sounds delightful! Thank you for recommending it. This entry was posted on August 26, 2014 by Laura Cunitz in Yarn & Yarn Shops and tagged Classic Elite Yarn, Provisional Crochet Cast On, Soft Linen, summer yarn, Yarn Review.